Sunday’s Ford EcoBoost 400 just might be the biggest race of Jeff Gordon’s life. And it just so happens that it’ll likely be his last. If he can finish ahead of Kevin Harvick, Kyle Busch and Martin Truex Jr. in the final event of his last full-time NASCAR Sprint Cup Series season, Gordon will walk away with his fifth NSCS championship. Already fourth on the all-time championships list, the No. 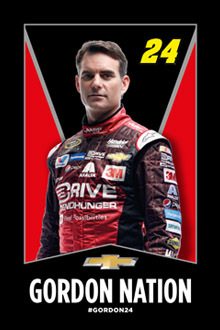 24 Chevrolet driver would end his career behind only Jimmie Johnson (six championships), Richard Petty (seven) and Dale Earnhardt (seven) in the NASCAR record books. Luckily for Gordon, he’s performed well at Homestead-Miami Speedway where the Ford EcoBoost 400 will be held. In 16 starts at the 1.5-mile track, he boasts one win (6.2%), seven top fives (43.8%) and 12 top 10s (75.0%). He finished 10th at Homestead last year after leading a race-high 161 laps. Gordon gutted his way into the Chase for the NASCAR Sprint Cup as its 13th seed, qualifying on points. He’s upped his performance in NASCAR’s playoffs, leading all drivers in average finish (7.7) and top-10 finishes (8, tied with Joey Logano), highlighted by his win at Martinsville. A Gordon championship would not only be his first since 2001, but his first in the Chase era (2004-present). If he wins the title on Sunday, Gordon’s 14-year gap between championships would surpass 2016 NASCAR Hall of Fame Inductee Terry Labonte’s record 12-season drought between titles. Gordon’s Hendrick Motorsports team already owns the NSCS record with 11 NSCS titles. Is Harvick the #NASCAR Championship Favorite? A Battle-Tested, Worthy #NASCAR Champion??? Are NASCAR Penalties Too Inconsistent?